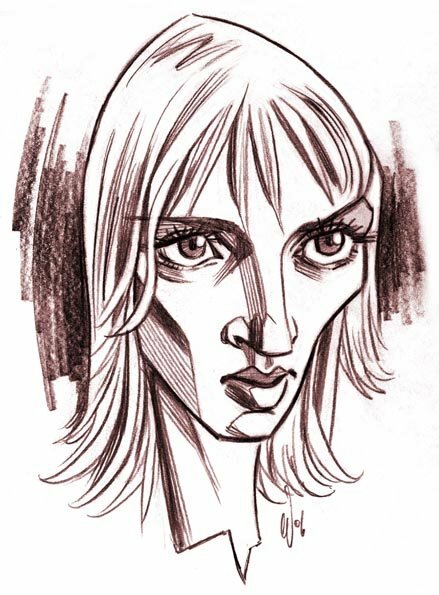 A couple of caricatures of actress Uma Thurman, from the Caricature Jam over at The Drawing Board. Not an easy one to draw. She has so many caricaturable features, the challenge is finding a good balance. Hell, even her ears are funny-looking. 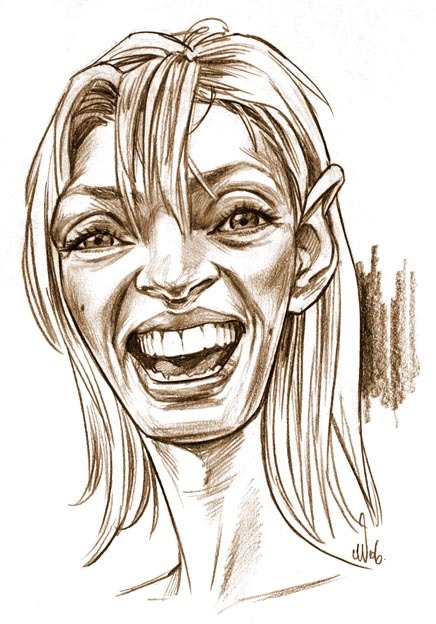 Attractive women with odd (or what might normally be considered unattractive) features always seem to be the most difficult to caricature. I know, it's so tempting just to exaggerate the features and make them look hideous. Uma's quite a paradox. All of her harsh features combine to make something strangely appealing. It's like they all cancel each other out. These are so well done! So Uma, especially the last one. I love Uma, she can have the most ugly face and still look so attractive. The 2nd caric really shows off her features! Spot on there! As a matter of fact she looks almost ostrich like! Chris, everytime I visit your site I am constantly inspired. Your work is amazing, and the fact that you are self taught really motivates me to strive to improve. I've never got the chance to watch too many other artists draw, and your videos greatly motivate me. I can't wait for the voice-overs with the videos. Keep up the amazing work! I've been having the hardest time with caricatures lately. Someone commissioned me to do some for him, and a bunch of them are women, and I just can't figure out how to caricaturize a woman without making her look ugly and/or stupid while keeping a likeness. These are exactly what I have been trying to achieve, and the likeness is so dead-on it's unbelievable. Thankyou all for such wonderful feedback. I really appreciate your comments.